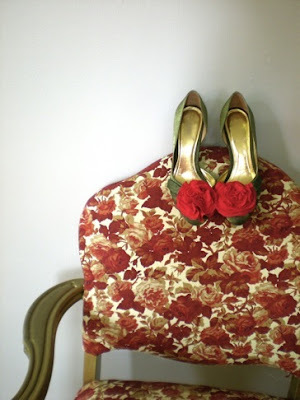 I am so digging these vintage linen shoe clips* by b. poetic. You can snap em up in red and white from her Etsy store (or put in a custom order). And be sure to check out her blog. *A rad alternative to, you know, putting the damn flower on your head. shoe clips!? that's the best idea to glam up some drab shoes. i love it. YUM. Of course finding exactly the right shoes to affix them to could be... tough. But if I can just do that... hum. wanna have the, to create party shoes for fashionweek! I really like that they are that big. piss off with the hair flower bashing. I've been eying these vintage cockade pins (for shoes) on etsy lately. Lets move past the headgear please. I made my own fabric flower shoe clips for my wedding coming up this weekend. I was pretty set on getting yellow shoes with flowers on them but the only ones I could find to buy were around $100+ so this was an excellent affordable option. Also, now I can take them off and use them to spruce up other pairs of shoes too. Those shoes would make me feel like an elf, but in a good way. I'm starting a poll to see how long it takes until you post about how sick you are of giant flowers on shoes. 6 months, Emilia Jane. It's going to take three months to catch on. Clock. Starting. NOW! Love the snarky. Though loves the flowers on the head. The bigger the better! What can I say? I was a child in the 80s! is it weird that i hear Buffalo Bill's el creepo voice saying this entry's title? "it puts the flowers on the shoes..."
EEEEEEEk. i need to get off the internet and take some vitamins or something. H and I do Buffalo Bill around the house pretty often. Is it possible you're hearing MY voice...? Yup, love 'em. I'd have to wear them every day, in fact. An excuse to take up salsa dancing? I just purchased a pair of red Steve Madden pumps with flowers on the toes and I love them! It's a great style! Thanks for sharing these clips. I've only recently discovered shoe clips and I'm LOVING them. Clipping flowers to your shoes can put life back into any old pair as large roses and other flowers can easily hide any scuffs and marks. Alot of brides where I am from don't like to spend much money on their wedding shoes. I need some of these for my shop and they won't need to buy new shoes at all! Plus I have beef with 'Bridal Shoes'. Not my fav. wow love those shoes, so pretty. gorgeous shoes! i love it! Pretty shoe clips seem to be very popular these days -- i love how they can transform a pair of shoes into a completely different look.